Yoga is creative, fun and educational, suitable for all ages and capabilities. Yoga is fun and can benefit us in so many ways …. Yoga gives me space, a sense of calm, a community, values and lots of joy. 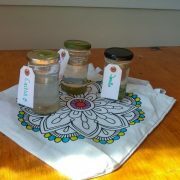 Teaching yoga enables me to bring this to others. Less than 2 weeks until Scapa Fest 2019 - The UK's Yoga and Adventure Festival- so excited to be teaching kids and family yoga. Some helpful springtime tips for your practice. Thank you Yoga on Gaia. What will the Easter bunny be bringing you? Hopefully a ticket for our easter pop up parent and toddler session at Yoga Hero on Good Friday. 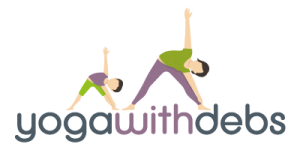 Yoga with Debs recommends Shadwell Studio. 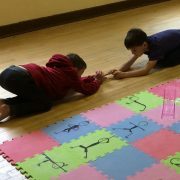 More sessions available to book now for May half term as well as family yoga and yoga for additional needs. Please visit the studio website for details! 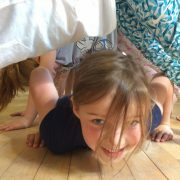 Family Yoga is open to everyone – kids 5-12 yrs, mums, dads, Grandmas and Grandpas, Carers, aunties, uncles, cousins and great-great-great Auntie Jean! No yoga experience required and you do not need to be super fit, just a willing spirit! Yoga is beneficial for all babies & toddlers, you don’t need to practice yoga or even know anything about yoga to get started. Sessions include massage, stretching, movement, breathing, and relaxation along with rhymes and songs. Seasonal Yoga flow is a style of dynamic Yoga practice which is designed to align you with the changing energies of nature and the seasons. It is a practice that improves physical strength and flexibility and brings balance and harmony to your life. Children’s yoga is accepted and practised in many schools across the UK. Please contact me to discuss opportunities to integrate yoga with the national curriculum, classroom yoga and training for teachers and yoga classes as part of your school wellbeing/sport activities and events. As well as the physical benefits of physical strength, flexibility and balance from a regular practice, yoga can provide teens with essential life tools such as self-esteem and confidence, inner and outer strength, attention and concentration, and heightened awareness of both oneself and others. My Jessica 7 and Finlay 6 LOVE these classes! Debs has such a lovely way with all the kids (and parents) even though my boy can be distracted and fidgety Debs keeps it positive and him focused and he comes out of class so happy. Jessica my eldest is really begining to understand her body and movement and has really progressed this last three months. Today they came out of the summer camp class and Finlay said “that was the best fun ever” well done Debs you are creating something so special! My kids weren’t at all sure if they’d like this – they’ve seen me practice and it looks ‘boring’. They changed their minds after just one class with Deborah. I’m told it’s ‘way more fun than grown up yoga’. My son loves the games and my daughter loves the relaxation. They’ve both really responded to it – Deborah has a great positive approach. My boys love their weekly yoga class! Their favourite part is the relaxation at the end. Such a fun way to get kids into yoga. Brilliant! My son absolutely loves this class & looks forward to it every week. He enjoys the yoga, the games & especially the relaxation at the end. He has also found the breathing exercises helpful at bedtime. 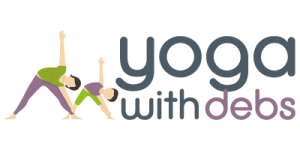 Debs is the perfect yoga teacher for kids!